Powers/Abilities: Superhuman strength and speed. Able to fly. Indestructible. Super wisdom. 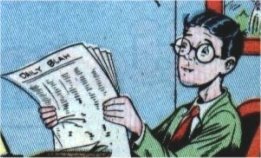 Could change between human and superhuman form by employing a magical formula, though eventually he got stuck in the latter state after visiting "comic land" for too long. 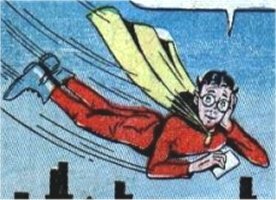 History: Having been given superhuman powers by the wizard Merlin, Wilbur Klutz decided to use his new abilities to make money, setting himself up in an office and taking out adverts in the Daily Bugle and Daily Blah as Lieutenant Hercules, a superhero for hire. His manager was Merlin. Comments: Created by H.L.Gold and Irv Tirman. He appeared in Green Lama #1-8. 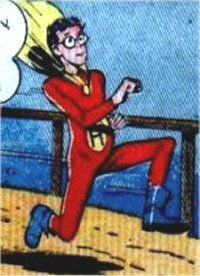 Images courtesy of Steve Rogers' Golden Years Comic Book Library.